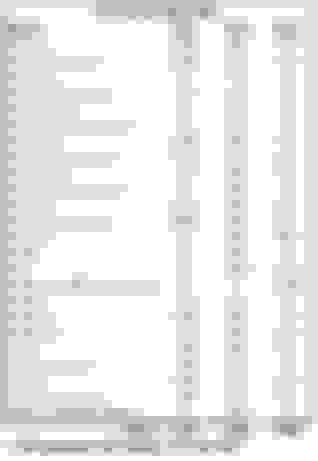 I'm looking at paint code 98 for non-metallic PTS and 99 for metallic PTS. Option code 39 for Touring w/ Black Trim and 32 for Chrome Trim. Interesting I have the only PTS with chrome trim in Canada. I'd really like to break out PTS into the actual colors, but it'd be hard to do without associating the color to the VIN. 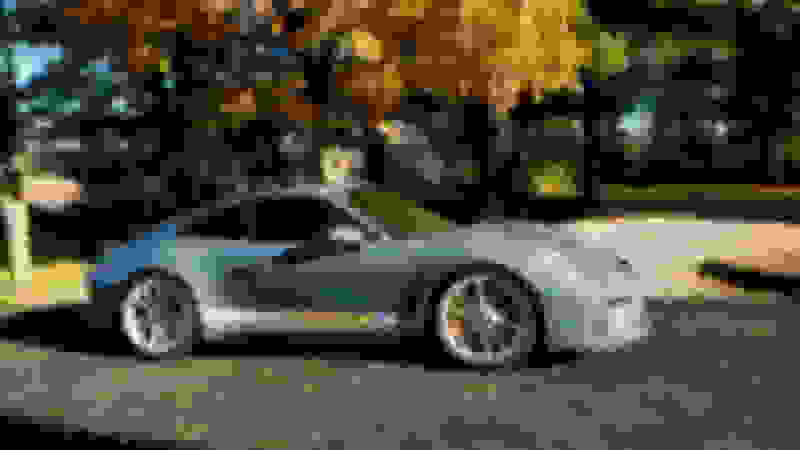 My data lists that a car was built with a custom color, but not the actual color. I did a quick pass of the internet and came up with VINs for 23 PTS cars that were/are for sale. Montoya (google doc) and evilfij have the 2 best lists of PTS cars (~150-ish cars), but they don't have VINs associated with them. We can either add a "VIN" column to Montoya's Google Doc or folks can PM their PTS VINs. If we get enough of a critical mass (~100 cars) I can start breaking the colors out for those that are curious. I'm happy to supply my VIN. There may not be but I know of 5 inbound...plus in Canada I know of some late GT car allocations handed out this month. Want to know a rare Touring? My buddy JP has a Graphite Blue black trim touring in Oakville that I believe is 1 of 1 in Canada. Graphite Blue GT cars are low numbers overall. Great data put together, thank you! Overall, this bodes well for fututre GT car buyers. Given the number of cars they can make now, everyone should be able to get a car. Stealers may want to chrage ADM, but a bit of hustling should get one a msrp deal. It's a safe assumption that Porsche will build more 992 GT3/RSs than it did 991 ones too. Yes. Just look at 991.1 series to that of the 991.2 which I posted in the 991 section thread. curious if Pors9 has a response to your 991.1 numbers as there are major discrepancies. Great Info either way, thanks Cams! Hey, this car looks VERY familiar. Being 1 of 2 in Canada is still cool I guess, especially on a non-PTS car. Really interesting numbers. The one i found really surprising was that over 80% select Sport Chrono. Based on the comments here i would have thought that number would have been far lower. Lots of good info guys. I have no idea why so many people opt for the wart? It's basically a clock. That was my conclusion so I didn't. I had it in my 997 S and I really didn't like how it broke up the dash. Beauty lies in the eye of the beholder. I have had 991s with and without sport chrono. I spec'd my GT3T with it. For my taste, I think it completes the look of the interior. I like it and have it too. So i agree with you 100%. But seeing that so many people here do not like it, i was thinking maybe 50 to 60% get it max. But over 80%? I guess it is like color. You read a lot of comments and white with black wheels being overdone, yet if you combine the two whites it isthe most popular color. And black wheels are very popular. Some things never go out of style! Every dealer spec car I have seen has it. And the non-cognoscenti think it adds functionality like on a non-GT car. Also, it is a low priced option as far as Porsche options go. Although some are projecting 1700 plus US 3 RS's there don't seem to be that many allocations out there. My dealer is a top 5 dealer and they have a couple of 2 RS's and a handful of 3 RS' allocations confirmed. There has been no second wave as with the .1 RS although the first wave of the .2 RS was bigger than the .1 RS. Porsche also always planned 2 waves of 2 RS's at a 1000 units per wave. Seems they are on track for that number. 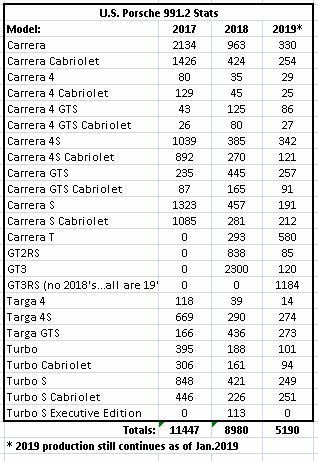 Clearly Porsche can make a lot more cars through May but given the relatively low number ( it seems ) of available allocations how do we get 100 per month more cars in the US ? so while I agree with you on most points there are a few facts that need to be checked. I agree allocations seem to be done at this point but most all of the allocations for February, March, April builds were handed out in Q4 2018. I can also assure you if your dealer is a top 10 in the US they received a minimum of 20 3RS allocations and over 10 2RS. Regarding .1 3RS PAG always reserved two separate banks of VIN’s for NA. (GS187061-188000 & GS192061-194000) That was never the case with .2 (KS164001-170000). i haven’t heard many say there will be over 1,700 3RS in the US and after tracking 3RS production since June I’m personally estimating up to 1,775 for N.A. This will break out to roughly 200 for Canada and 1,550 for the USA. to date there are 1,350 NA GT3RS that have already competed production. Q4 2018 alone they built 750 for N.A. January they do seem to be a bit slower but will still exceed 100 units and the factory was closed from 12/20/18-1/6/19. Assuming they continue to build through April/May and average just 100 units per month which is very low output for PAG then we end up with ~1,775 NA 3RS. Last edited by Dot23RS; 01-27-2019 at 04:14 PM. My dealer is relatively small (Chandler AZ), but they got 5 2RS and 6 3RS that I know of and could have got more. They are only 3-4 years old as a dealership. So your dealer isn't that big or they aren't being truthful with you.